There are plenty of people who want to get into trucking as local drivers, and there are certainly plenty of local truck driving jobs available. It would seem logical to just go right into a new trucking career as a local driver if that were the ultimate goal, but traditionally the safest surest way to get your trucking career off to a great start is to start out being an over the road driver. Let's look at some of the reasons why this choice makes the most sense, and hopefully clear up a few misunderstandings about a career in trucking along the way. Getting a trucking career off to a great start has proven to be a most difficult task for thousands of wannabe truck drivers. I often say that the trucking career is one of the most misunderstood careers there is. A brief search online concerning this career will easily produce tens of thousands of people who were unsuccessful at their attempts. Most of them I would place into the category of people who had no clue of how to succeed at trucking. They completely misunderstood what it takes to come out on top in this challenging environment. What's worse is they now persist in pointing fingers and blaming others, which only confirms they still don't understand why they weren't able to succeed as truck drivers. In our forum at TruckingTruth.com, we recently had someone inquiring if there were any CDL training programs that he could get into that were provided by a local company in his area. He wanted to be a local driver who didn't have to be away from home, and he wanted his weekends off. Of course that all sounds logical and reasonable to someone who has never been in the trucking business, but it illustrates how misunderstood this career is by those of us who have worked at factory jobs or “nine to fives.” Truck driving jobs are very demanding in terms of hours and length of days worked, and while they can pay very well, there are typically just a few people who are committed enough to handle the rigorous demands of the career and develop themselves into the type of driver who is worthy of those rewarding levels of pay. Nobody just steps right into this career and finds themselves at the pinnacle of success. It is a hard fought battle for most of us just to make it to our one year anniversary. To a person outside of this industry, that may sound a little odd, but it really is quite an accomplishment. For a rookie driver to last for a full year out here is a great accomplishment, which is why we give hearty congratulations to each of the folks in our forum who announce their one year anniversaries to us. So, what is it that makes it so hard to get this career off to a great start, and why is it that few ever survive even their first year as new truck drivers? I believe the biggest reason is something we've already been discussing here. People just don't have a proper understanding of what it is they are getting themselves into. It is really difficult to find helpful information on the trucking career that is truthful and honest. I don't even think it is because people would intentionally lie to you about their trucking career, but simply because there are volumes of testimony online from those who failed at trucking, yet never really had any true understanding of why they failed. It is a like a self-fulfilling prophecy the way the lies and innuendo concerning the trucking career keep morphing into legendary tales of mistreatment and corporate greed. It's disturbing to the many professionals who are out here enjoying this career and lifestyle, and the reason why some of us spend so much time and effort at trying to help others have at least a basic understanding of how to make this work. When you start your career as an over the road driver with a large trucking company, you are getting started at a place that knows the ins and outs of this whole career and has the ability and the financial backing to offer you training and support as you spend that first year putting in the effort necessary to develop into a productive driver. Anytime you start something worthwhile, it is always best to start in a manner that will help you achieve your goals. It would be foolish to start investing in the stock market with borrowed money from your credit card. You are maybe going to make 8% in the market, and you are going to owe a much higher rate on the money you borrowed. Why start out with a deficit that is sure to catch up with you? That is what many people do when starting their trucking careers. Their deficit is knowledge, and it comes in the form of misinformation. By starting your career with a well known large trucking company, you can rely on their knowledge and their experience to help you break the barriers that hinder most newbies who attempt success at trucking. It takes a considerable amount of time to become proficient at trucking. New drivers tend to focus on the physical parts of their job, things like double clutching , floating gears , and backing a truck properly so that you can line it up with a loading dock. These are the things that trouble a rookie, but he soon gets past those issues and then realizes that he has bigger fish to fry if he is going to succeed at this career. This is where working with a large national carrier can help you immensely. They have the resources to help you continue to learn and develop your career into something worthwhile. The company I work for has all kinds of opportunities for additional training, and much of it is available online 24/7, whenever you have the time to look into it. Things like time management and trip planning begin to come into your focus as you begin to realize their important role in your strategy for success as a professional truck driver. It is always prudent to start out doing something new by exposing yourself to the least amount of risk. Are you aware that almost 95% of the people who attempt a new trucking career never make it to their one year anniversary date? Sounds like there is a high risk factor here doesn't it? This is not a career choice to be cavalier with. It takes commitment, and the proper approach so that you end up with successful results. The larger companies have training programs designed to help you break into the career, and they understand how to deal with rookie drivers. They are also usually self insured so that they can afford to take on new drivers and the added risks that they bring to the table. The smaller companies who are offering local jobs tend to fire new drivers who end up having a minor fender bender. This isn't because they are cruel and ruthless, but because their insurance underwriter dictates who they are willing to be liable for. An accident on your record, even a minor one, immediately puts you into a higher category of risk. This issue of insurance is really a big deal when starting a trucking career, and let me explain how it affects your career. If you go to a private truck driving school and then somehow land a local driving job as a rookie fresh from driving school, that would sound like a pretty sweet deal. It's the very thing that many people think they want. Now let's fast forward to the many testimonies I have seen in forum comments of people who managed to pull this off, only with one little hiccup that they hadn't planned on. Most people do not understand how hard it is to start this career without making a few minor mistakes. Things like accidentally bumping into something while trying to back that monstrous truck into some incredibly tight situations. It happens. I would dare say it happens way more than you could ever imagine. Are you aware that one of the most common events that causes an accident in a big rig is a simple lane change? Something that is easily done in a car takes on a whole new dimension in one of these behemoths. I recently saw a report where Prime had paid out 51 million dollars in accident claims in 2016 – $51 million! I share that to illustrate the proclivity for these kind of things to happen out here. That does not mean that Prime has a bunch of terrible drivers. On the contrary, they are a very successful trucking operation. When this happens to a person who is new to the industry, and working for a smaller operation as a local driver, they often end up being unable to land another job in the trucking business. The other local companies can't get their insurance company to agree to cover someone with a recent accident on their record, and the large national companies do not consider that driver's local job as experience. He has been out of trucking school for a few months now which is too long for his certification to be considered valid. He now finds himself in a virtual “Catch 22” where he is unemployable. Another advantage of getting started at a large carrier is the many options available to you as you are pursuing success in your new career. If you can get started at a large national carrier who has multiple divisions you can easily move from one driving discipline to another. For instance, I work for a company that has dry-van, refrigerated, inter-modal, and flat-bed operations, not to mention all kinds of dedicated account options. It would be beneficial for a rookie driver to start off in the dry-van division (the least amount of risk), and then once they have improved their reliability and their safety habits to move to a different division which interests them. This move may have some additional risks, but also some higher levels of pay that come with it. It just makes good sense to make prudent moves in this business, and the easiest moves to make are always going to be right there within an organization that already knows you and has a track record of what you can do. It is impossible to move to another division in a company that is so small that it has no other divisions. The only way to accomplish that is to change companies, and that means you must work really hard at establishing yourself at another company again which usually means a decrease in the actual monies you take home, even if you manage to get into a higher rate of pay. Personally, I would be bored to tears with a local driving job, but that is not the premise for these conclusions. I happen to love being over the road , and you would be hard pressed to put me in a local driving position. There is so much adventure to this whole career, and it is the variety and adventure of driving over the road that keeps me happily doing it. I love the challenges of it. I love the adventure of it. I actually enjoy waking up in a new place each day and not really knowing where I may find myself at next week. I find all kinds of interesting places to visit. I enjoy visiting little cafes along my way, attending local sporting events wherever I happen to be, and meeting interesting people in my path. I enjoy the journey more so than the actual destination. It is the journey of this whole career that is both rewarding and challenging. It is the journey that you must figure out how to navigate and conquer in such a way that you are successful at this. Taking the proper steps to success is important when starting your trucking career, and I believe one of those steps is to make the commitment to being an over the road driver for one successful year of safe driving at a national carrier. People read so many horror stories online about how these over the road carriers treat their employees badly, and they start their careers with misgivings and doubts about working for these companies. They then make short sighted career damaging decisions like switching companies after only having about three months experience, all because they were misinformed by some anonymous online trucker wannabe who failed at his attempt at trucking. 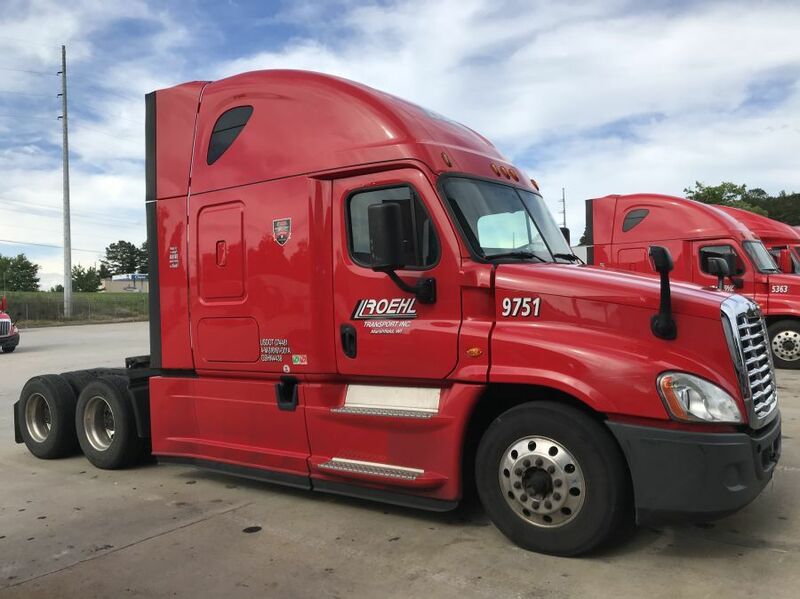 It has always been a prudent move to stick with your first trucking company for one full year, and it is even more prudent to make that start with a company that you can depend on to support you as a rookie driver. These large national carriers are the best places to make that initial start to this career, and they are also some great places to continue your career. I have been in this game for a good many years, and I still love working for these large companies. They have great financial backing and a lot of opportunities available to their drivers. All the same reasons that make them great places to start your career, are also great reasons to consider them as places to continue your career. See also: Podcast Episode 9: Are Major Carriers Nothing More Than Starter Companies? An expression used to describe someone who is shifting gears without using the clutch at all. Drivers are taught to "Double Clutch" or press and release the clutch twice for each gear shift. If you're floating gears it means you're simply shifting without using the clutch at all.